(Entertainment Weekly) -- Neither the magic of Harry Potter nor the combined star power of Katherine Heigl and Gerard Butler was enough to keep a crew of wise-cracking guinea pigs from scurrying to the top of the box office this weekend. 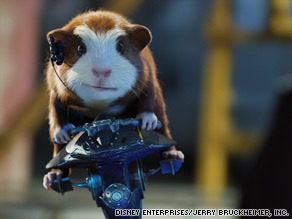 Disney's family comedy "G-Force" made an estimated $32.2 million in its debut. Disney's family comedy "G-Force," produced by Jerry Bruckheimer and featuring the voices of Nicolas Cage, Will Arnett, and Penelope Cruz as a team of world-saving rodents, made an estimated $32.2 million in its debut. Despite opening hot on the heels of the one-week old "Harry Potter and the Half-Blood Prince," the animation/live action hybrid pic was a hit with young audiences, pulling 55 percent of its viewers from the under-18 crowd. But Potter's box office magic hasn't worn off just yet: The series' sixth installment landed in the number two spot its second weekend with $30 million, bringing its total to $221.8 million. After just 12 days in theaters, 'Half-Blood' is already the fifth biggest hit of the year domestically, not to mention overseas, where the powerhouse has raked in an additional $236 million. There was plenty for adults to enjoy at the box office, too. "The Ugly Truth," a raunchy R-rated rom-com that pits Katherine Heigl and Gerard Butler in a battle of the sexes, scored an impressive $27 million bow, a career best for both Heigl and director Robert Luketic ("Legally Blonde"). The weekend's other wide release, Warner Bros' creepy "Orphan" -- starring Peter Sarsgaard and Vera Farmiga -- pulled in $12.8 million from an audience that was 55 percent female. Lower down on the chart, Fox Searchlight's "(500) Days of Summer" (at number 11 with $3 million) is still building momentum. The quirky rom-com posted a hefty $19,176 per-site average and a 95 percent increase over its debut last weekend.